Reference number for this case: 6-Oct-54-Bessèges. Thank you for including this reference number in any correspondence with me regarding this case. "I saw in a field an unknown craft and a small being covered of hairs"
M. Andre Narcy, 48-year-old roadmender in Mertrud (the Haute-Marne), went Wednesday morning to his work by motorcycle when near Voillecomte, at 07:15, he noticed in a field, at the locality [illegible line] an object of orange color, while approaching he noted that he was in the presence of an apparatus unknown to him. The roadmender stopped his machine and, by foot, arrived at a hundred meters of the object. At this point in time he saw in the vicinity a small being, approximately 1.20 meters tall and dressed of a jacket covered of hair. Mr. Narcy was very afraid and lay down on the ground, then he called the individual. The latter, after having turned to him, entered in his apparatus which flew away immediately vertically to lose itself in the clouds. According to Mr. Narcy, the craft was of spherical shape, had a diameter of ten meters approximately. Under the sphere was a kind of spindle and the port-hole by which the being entered the machine was just between the spindle and the body of the apparatus. At the start of the apapratus, a kind of flame came out of this spindle while a large vaporous movement occurred under the machine. Mr. Narcy went at once to his work where he told his adventure to his comrades. With two of them, Misters Riel and Henry, he returned on the spot where he noted that the dew did not exist any more on a certain surface. The grass had a slightly milky colour and was crushed on a square of approximately three meters side. Moreover, twelve parallel traces resembling prints of steps of round feet were spread at a certain distance, giving the impression that the apparatus had landed in a succession of small hops. Are we the only ones not to see "saucers"? This void is filled since the evening of the day before yesterday (and even before it seems). The mayor of Uryssi, close to Mytilene, claims to have seen during fifteen minutes, above the village, a pink and white flying saucer. Tenants of the building located at the 6 of the Victor-Hugo street, in Bessèges, observed Wednesday evening, starting AT 10:15 P.M., a mysterious light in the sky. This reddish gleam moved little by little and disappeared gradually at the end of ABOUT TWENTY minutes behind the mountain. One of the witnesses, initially skeptical, had to convince himself that the light had obviously moved. Two days before, the residents of a nearby house had also observed a phenomenon of the same kind. 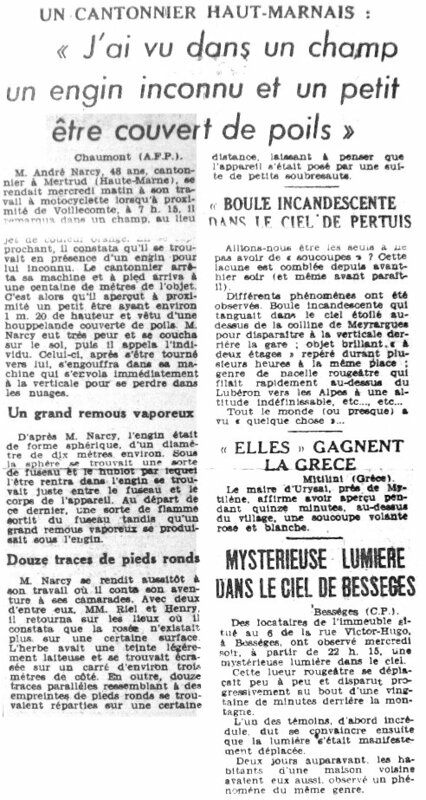 [lp1] Article in the regional newspaper La Provençal, Marseilles, France, page 12, October 8, 1954. 1.0 Patrick Gross September 19, 2014 First published.